When you mention engineered wood, you most likely hear the name Trus Joist, a Weyerhaeuser company. Trus Joist is the original manufacturer of Microllam LVL and TJI products. Brunsell has been partnering with Trus Joist for the past 20 years. Brunsell was the first stocking dealer in Madison, Wisconsin, and continues to stock Microllam LVL and TJI, along with Trus Joist’s Timberstrand, Rim Joist, Studs, and Parallam lines, among others. 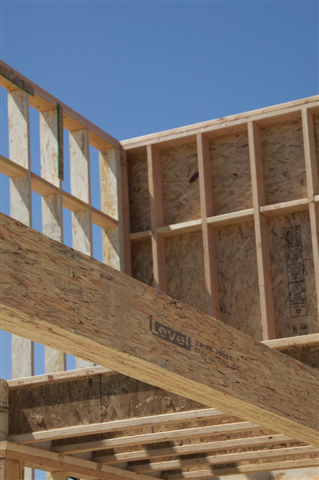 We continue to partner with Trus Joist because of its quality engineered products and outstanding service, not to mention its close affiliation with Weyerhaeuser. Trus Joist remains, as always, among our most-valued partners. Choose the best value in engineered wood: Brunsell and Trus Joist. Regardless of with whom we work, our goal is to provide computer-designed floor, wall, and roof trusses engineered to perfection. Tall walls, large openings, and large beams are some examples of what we can design for you. In addition, we offer design and engineering solutions for complex code-compliant situations. Do you need glue-laminated timber? We have a large selection of engineered beams and posts used for larger load-carrying capacities, longer spans, and architecturally pleasing appearances. Beams and posts are constructed of 2×4 / 2×6 Douglas Fir or Southern Yellow Pine, laminated together for a large variety of sizes. Custom-sized and radius beams are also available on special order.